Fresh accumulations on the mountain today from last night's system. Winds are strong today ahead of the next storm that will push through late this afternoon, evening, and overnight. Powder day on Monday! More storms likely later this week! Yesterday we had a weak impulse move through. While it didn't do much, it did leave a nice moisture fetch going in the mountains in a SW flow during the evening and even early morning hours. Snow continued, particularly in SW-flow favored areas of the Central Wasatch. Brighton is reporting 15" of new snow this morning! Other areas reporting about 8" in the Central Wasatch. Outside of this area, most resorts only reporting 2-3". Wind is the main story for the day today. The cold front is approaching and ahead of it, we will have plenty of winds out of the south. Gusts are already 50+ mph on some of the ridges and I'd expect these to increase further prior to cold front. The cold front will push in from northwest to southeast across the state. Far northern Utah will see it early afternoon, late afternoon for the SLC/PC/Cottonwoods region and then overnight farther south. This is a very strong cold front and that means that we could see some lightning and thunder along with it. We will also have several hours of HEAVY snowfall this evening. We should see accumulations stack up quickly. Right now it looks like 6-12" for most mountains, Cottonwoods will likely see more with up to 18" of snow by tomorrow morning. The winds will have subsided and Monday should be a great powder day throughout! 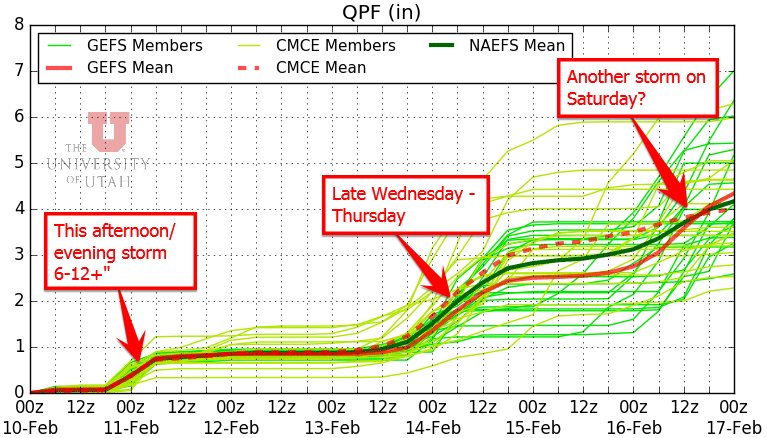 It looks like potential for a good storm moving in later on Wednesday and into Thursday. There is still uncertainty on the details and you can see there is a large spread in the ensembles still, but we are monitoring that storm. Beyond Thursday, it looks like another storm for the weekend. GFS has this one as stronger and pushing in as early as late Friday and continuing into Saturday. The Euro generally has it weaker and as more of a closed low that meanders into Utah on Sunday. I don't see too many signs of the storm door closing. The high pressure ridge in the Gulf of AK remains and we see energy continuing to drop down the west coast from BC well into the extended range. We should, hopefully, be able to continue to pile up the snow.